Last Friday morning began our trip to Yamanaka Lake, at the base of Mt. Fuji. Our straggled line of now semi-experienced foreigners marched through the streets with bags in tow, off on our first adventure outside of Tokyo. We arrived at Meiji University and clambered onto the bus; each USC student was asked to sit next to a Meiji student. At first, we awkwardly danced around each other as people often do when they when they are just getting to know one other. Despite the language barriers, we began to get to know our Meiji supporters and bonded with them over the toils of long bus rides, cute puppies at rest stops, and glimpses of Mt. Fuji. Before getting to our final destination, we made a brief stop to take a group photo and admire Yamanaka Lake, cold on that breezy day and surrounded by forests greener than any I have seen in California. In our free time, we rode paddle boats on the lake! It was harder than it looked- my boat felt like a mountain bike on the highest speed! We ended the night with a party of snacks and drinks. USC and Meiji students traded card and drinking games; Egyptian War for the Japanese version of Spoons, King’s Cup for “Go, Back, Jump.” In happy spirits by bed time, we retired to our traditional Japanese tatami rooms. Our Meiji friends taught us how to lay out our futons (“Shikibuton, then shiitsu (sheets), then kakebuton!”) complete with rice-filled pillows. Those of us brave enough “went native” and used the traditional communal bathhouses to wash up. Saturday was largely dedicated to the PowerPoint presentations we USC students prepared for Meiji students to share with them our thoughts on those aspects of Japanese culture and society that most intrigue us. The topics presented included Japanese subcultures, food and dining, efficiency, social responsibility, collectivism, architecture, education, and politeness. Following each presentation, we opened the floor to questions and were able to hear the Meiji students’ comments and criticisms about our visions of Japan. It was riveting to learn the difference between each of these topics as they exist in Japan versus in America. Saturday night was a treat for all of us, as we learned of a surprise fireworks gathering on the beach! Some Meiji students started blasting Katy Perry’s “Firework” on their phone and a huge group of us sang and laughed about the small commonalities between us as we walked to the lake shore to light the fireworks. The other amazing experience that night, aside from dancing, singing, and karaoke, was watching two Meiji students perform shodo, traditional Japanese calligraphy. 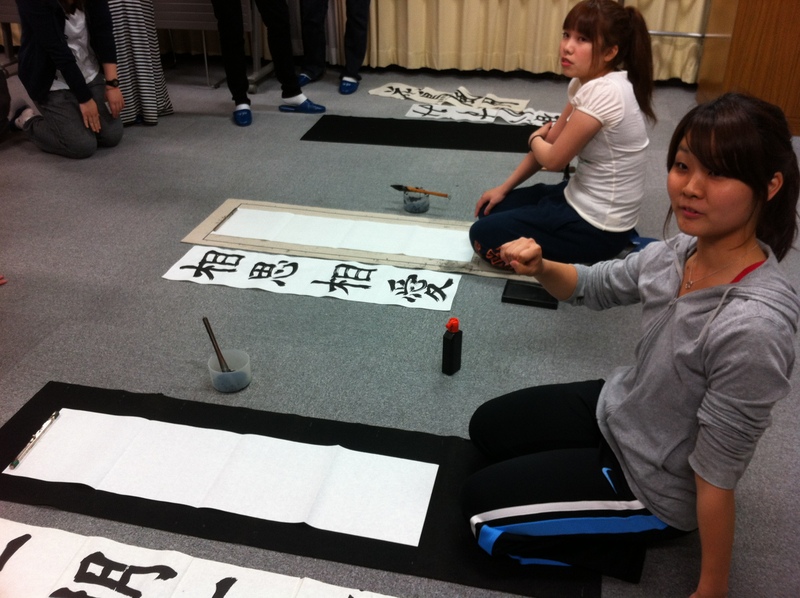 Some of us stayed for hours following their skillful demonstration to learn and practice the art of shodo. Meiji students taught us the art and skill of Japanese calligraphy. The following day’s discussion with the Meiji students was about improving cross-cultural communication. We were first divided into several groups, each with both USC and Meiji students, and then discussed the topic in our individual groups. For both sides, this exercise proved to be a real illustration of the challenges of interacting with a new language in a new culture. The final event of our trip had originally been planned as a trip up Mt. 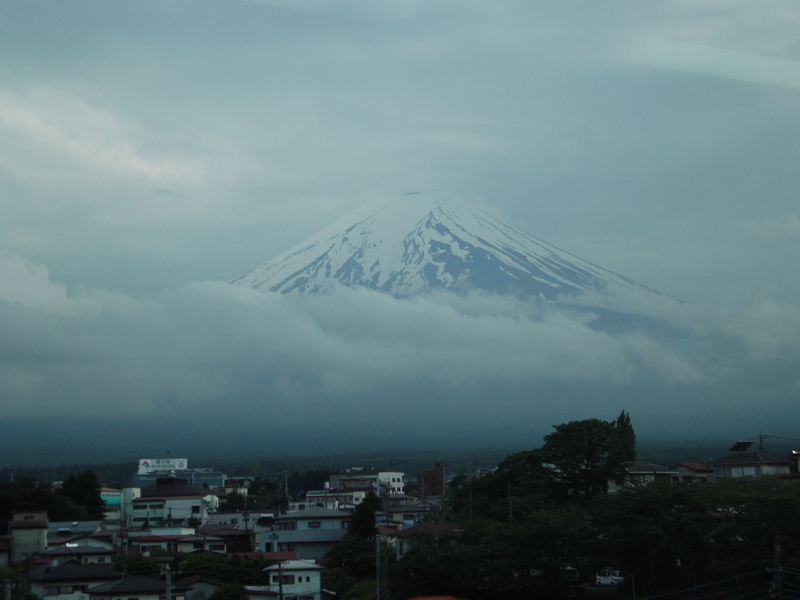 Fuji, and was a much anticipated event by everyone. Despite a light rain that morning, we were not deterred from our plans. However, there was yet another challenge awaiting us that day: the road up Mt. Fuji had been closed for a cycling event, preventing us from going any farther. In the end, even though we weren’t able to climb Mt. 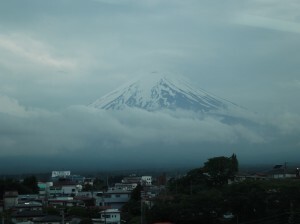 Fuji, we were content to simply see the summit on the first day, and also be able to spend the entire weekend so close to its presence in such a great environment. The beautiful view of Fujisan on the way to Yamanaka Lake. 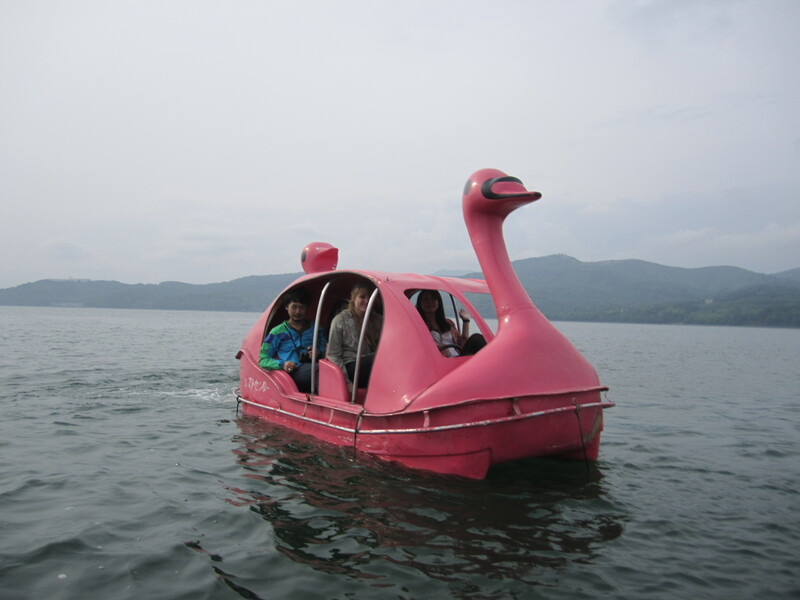 This entry was posted in Travel, Yamanaka Lake by geajapan. Bookmark the permalink.